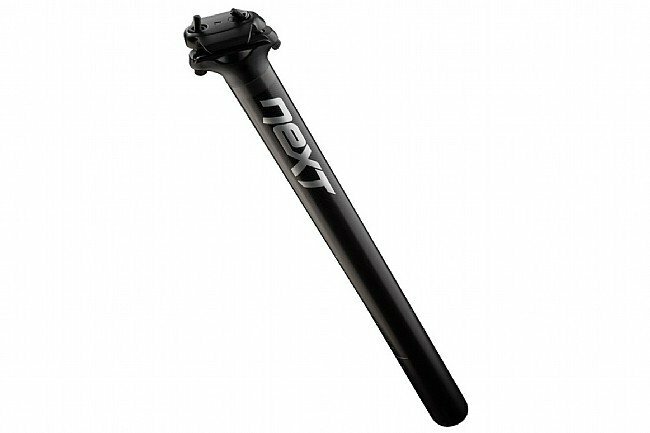 For XC and trail riding, the Race Face Next SL Carbon Seatpost gives crucial lightness with its unidirectional-carbon post, and it also makes saddle adjustments and hassle-free yet precise endeavor with its thoughtfully designed Hunter head. The two-bolt head allows saddles to be removed without completely dismantling the clamp, and the bolts are angled to permit easy tool access. A thumbscrew enables finely-tuned angle adjustments, and the narrow upper cradle opens up more room for fore-aft positioning. Available in multiple diameters. 400 mm length. Claimed weight is 250 g (size 30.9 mm). Includes rubber seatpost grommet to seal out water at the frame-post junction.